The ginkgo is one of the planet’s oldest and longest-lived trees. The species is a living fossil, largely unchanged for some 300 million years ago. A highly unusual tree with uniquely fan-shaped leaves, it can get very tall (20 to 35 m or more), but it grows extremely slowly: some trees are believed to be more than 1,000 years old. Ginkgo biloba originated in China, where it has been used in traditional medicine for thousands of years, but is now grown in many places around the world. Ginkgo is a “brain herb” that improves memory and age-related mental decline. It improves blood flow to the far corners of the brain, mainly due to its anticoagulant effects. It also encourages release of a powerful natural chemical called nitric oxide that helps to open up the blood vessels of the brain for better circulation and better cognitive function. Some of the nutrients in ginkgo leaves are powerful antioxidants, including the terpenes and proanthocyanidins. These compounds protect brain nerve cells, allowing them to communicate better and improving cognition and alertness. It may also increase synthesis of an important memory chemical called acetylcholine. 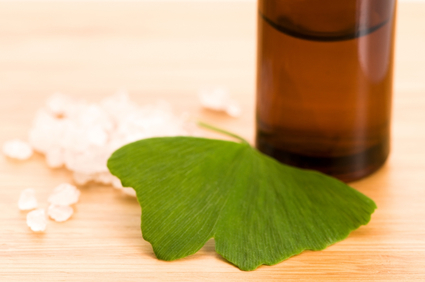 Ginkgo also helps with problems related to the eye. Macular degeneration and diabetic retinopathy— diseases that severely impede sight—are related to decreased circulation to the optic nerve, as well as inflammation and blockage of the tiny blood vessels in the eye. By opening up these blood vessels and decreasing the stickiness of blood platelets, ginkgo helps feed the optic nerve with blood nutrients and oxygen. The circulatory benefits are not limited to the eyes. Ginkgo also helps improve blood flow to the extremities and improves peripheral vascular disease, which afflicts those with diabetes, Raynaud’s, and Buerger’s disease. And if that wasn’t enough, it may also help circulation to the genital region to aid in erectile dysfunction.